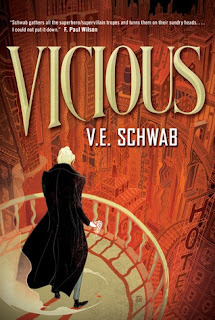 Review: I think my favorite thing about Goodreads is learning about new authors and series-this was my second VE Shwab book this year and once again-I LOVED it. Vicious follows college roommates Victor and Eli who embark on near death experiments to try to acquire supernatural powers. The ramifications of their actions results in a series of events neither of them could have predicted. This book reminded me of the 90s movie Flatliners mixed with Marvel super powers. Let me be clear-there are no good guys here, this is a book of villains. I usually need at least one character to 'route for' but in this case, I loved how evil everyone was. Fabulous read, cant' wait for the next in the series!